Shareholder advisory firm Glass Lewis thinks Goldman Sachs' board should rein in its executives pay. Shareholder advisory firm Glass Lewis wants Goldman Sachs to overhaul how it pays its top executives. The firm said Goldman's rationale for paying high level executives, including CEO Lloyd Blankfein, is largely arbitrary and not governed by any identifiable formula. "The compensation committee determines annual cash bonuses on a purely discretionary basis," Glass Lewis said in its report. Goldman Sachs' board gave Blankfein a 75% raise in 2012, granting a pay package of $21 million and making him one of the year's best paid bank CEOs. Glass Lewis gave Goldman Sachs (GS) a "D" for how it "pays for performance." Related: Does JPMorgan suffer from Dimon discount? The other major proxy advisory firm, Institutional Shareholder Services, disagreed with Glass Lewis and recommended that shareholders vote in favor of the bank's executive compensation plans. Shareholders have had the right to vote for or against how corporations pay executives since late 2010 as part of the Dodd-Frank Wall Street reform act. The so-called say on pay votes are non-binding, but boards typically listen up when a majority of shareholders vote against the plans. Major proxy advisory firms have been particularly aggressive this year in urging shareholders to push back against the status quo. Both Glass Lewis and ISS have advised shareholders to recommend JPMorgan install an independent chairman and vote against several directors at its annual meeting May 21. Together, the two advisory firms can sway the votes of up to 30% of a company's shareholders, including major mutual funds and pension funds, according to David Larcker, a corporate governance professor at Stanford's Graduate School of Business. Glass Lewis also urged Goldman shareholders to vote against the re-election of James Johnson, who heads the bank's compensation committee. The firm raised concerns because of Johnson's tenure as the former CEO and chairman of Fannie Mae and as a director of United Healthcar (UNH)and KB Home, (KBH)where CEO's "illegally backdated stock options." Glass Lewis also noted that Goldman's board gave themselves a raise this year. 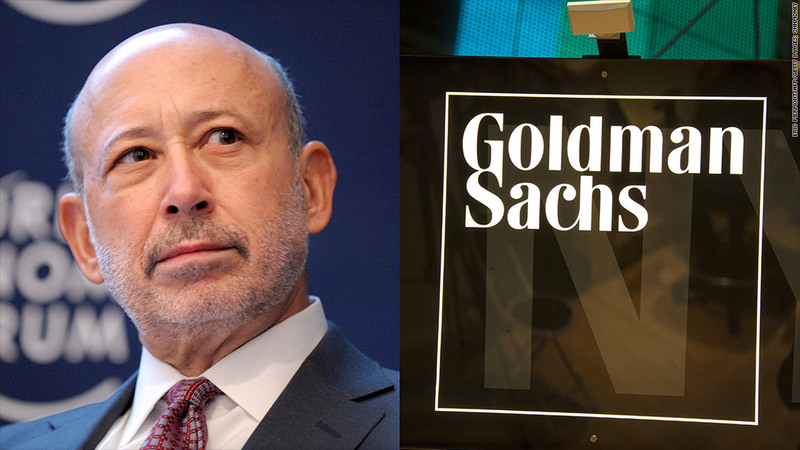 Each Goldman Sachs board member now receives 3,000 shares of the bank compared with 2,500 shares last year. Goldman's board members also received roughly $500,000 apiece for their work in 2012. Citigroup's (C) directors earn less than $350,000 a year, while JPMorgan's (JPM) receive less than $300,000. In addition to annual compensation, Blankfein and other top executives can invest their own money in funds managed by Goldman employees, which the bank does not consider compensation. Glass Lewis said those investments generated $31.2 million for Blankfein last year, and between $9.5 million and $30 million for the next six top executives. Goldman shareholders have no way to judge whether that's a conflict of interest, which Glass Lewis said was concerning. Goldman Sachs, which will hold its annual meeting on May 23, declined to comment.